I will try to keep this one fairly brief. 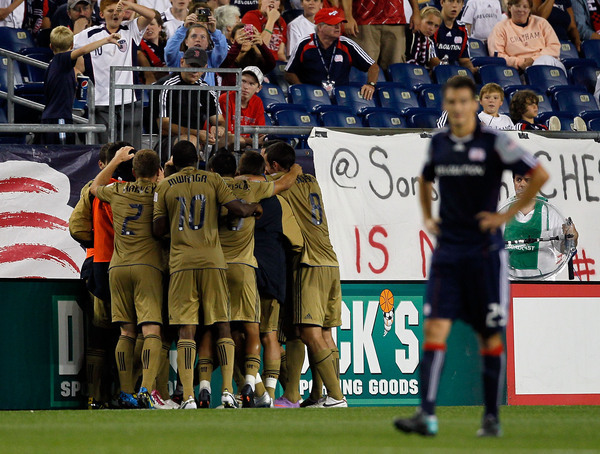 Both the New England Revolution and the Philadelphia Union come into tonight’s midweek clash a bit on the downside. Neither club has come into this match on a hot streak of any kind. But here we are, with at least the Union in playoff contention at the moment. Games like this are increasingly more valuable as we go on here into the last part of the season. A win tonight for Philadelphia puts them back into the automatic bid in the Eastern Conference. They’ll need a huge game out of rookie keeper Zac MacMath, who is in for the injured Faryd Mondragon. New England is in spoiler mode for me at the moment. Sitting at the bottom of the East, they could present a challenge tonight for the Union but that’s only if the Union fail to show up here. Philly has to keep an eye on young DP Milton Caragilo, he’s looked good so far in a Revs uniform. Have you considered tabulating all your predictions to see how right or wrong you are from week to week? I think it’d be a quick and easy thing to do and would provide some statistical analysis for when it comes time to start making predictions on the playoffs. I did it a few years back…it ended up being a little more work than I thought it would be. Maybe next year I’ll try to do it.